I wanted to go to Taco Bell in New York for three reasons. 1) I had never been before. 2) The legend that is Christy Altomare (who plays Anya in Anastasia on Broadway) raves about it all the time and 3) I tried to go in LA but the person working there didn’t know what vegan was so I was too scared he’d mess my order up, then I watched a YouTube video which explained how to eat vegan there. Taco Bell actually has a page on its website telling you how to make their food vegan. 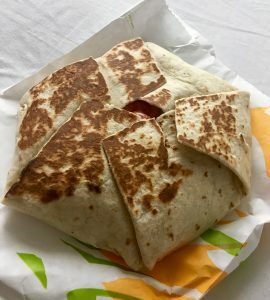 I wanted to try a Crunchwrap Supreme. If you substitute the beef for black beans and remove the sour cream and nacho cheese it is vegan. I messed it up and ordered it with beans rather than black beans but the beans were very flavourful so it’s ok. I guess it just lacked a bit of texture because the beans are a bit like a paste whereas the black beans are whole. It was quite tasty but it would have been much nicer with a bit of vegan cheese. We went to the Taco Bell Cantina on 8th ave which is really new. They had machines to order on and you can do all the swaps to make it vegan on these machines. Taco Bell cantinas serve alcohol and if you order that you just have to show your ID to someone when you pick up the order. 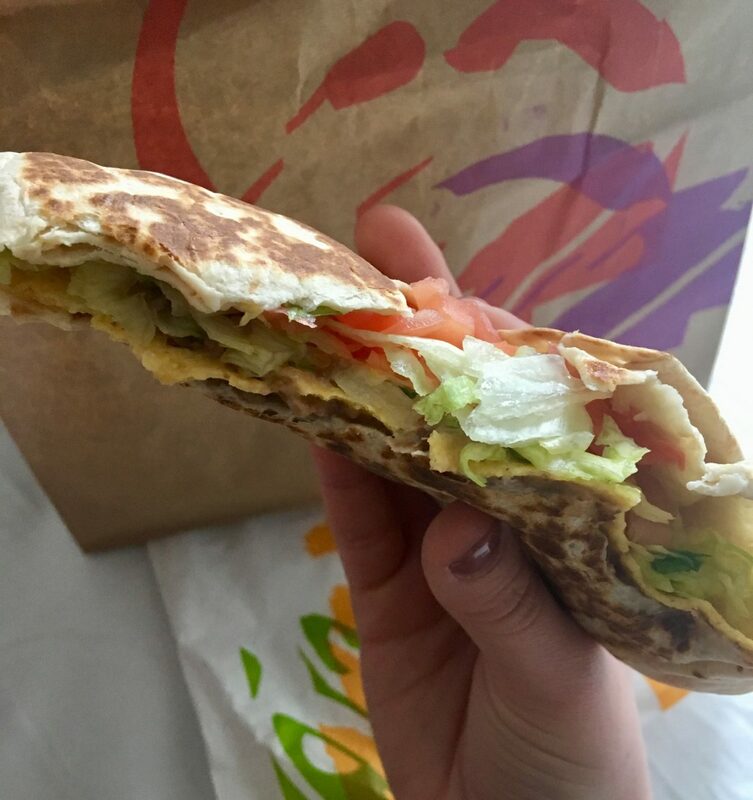 You can find out what else you can make vegan on Taco Bells website. There’s actually quite a few options!